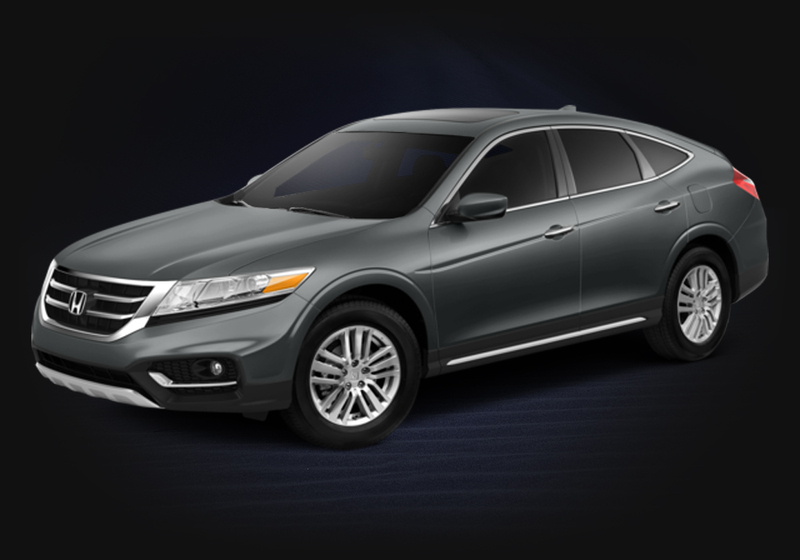 The 2015 Honda Crosstour is a truly unique hatchback that splits the difference between the modern crossover and the family sedan to deliver a family vehicle that manages to offer the versatility of a crossover with the handling of a mid-size car. With two different engine options, an available four-wheel drive system, an easily convertible cargo storage space, and some of the latest in technology and luxury amenities, the Crosstour has everything it takes to be your next family vehicle. While family sedans frequently used to have the option of an efficient four-cylinder or a powerful V6, most automakers have left those days behind them. We’re proud that the Crosstour still gives drivers the choice of powertrains with the option for Honda’s Real Time 4WD for added control. To give this Honda a sporty feeling, it has a double wishbone front suspension tuned for predictable cornering and to offer a smooth ride. 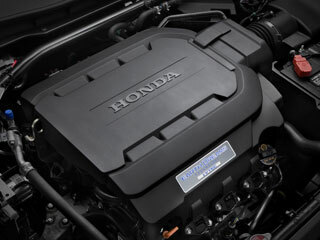 Under the hood of the standard Crosstour is a 192-hp 4-cylinder engine with 162 lb-ft of torque. 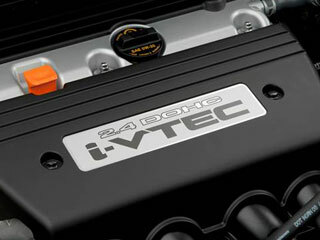 This small engine packs quite a punch while still bringing home an impressive 31 mpg highway fuel economy* thanks to its i-VTEC dual overhead cam design with variable timing control. Some drivers want a bit more power than a four-cylinder, though, and the Crosstour’s 3.5L V6 delivers on that promise with 278 hp and 252 lb-ft of torque. Although that’s a significant power upgrade, Crosstour V6 models with 2WD manage an EPA-estimated 30 highway mpg* with variable cylinder management shutting down two or even three cylinders while coasting to conserve fuel. 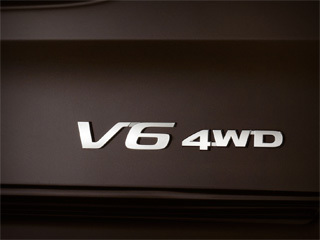 The sixth gear found on the Crosstour’s automatic transmission lets you take full advantage of the broad torque curve offered, bringing smooth shifting and swift acceleration while accounting for the incredibly efficient fuel economy of the V6 engine. 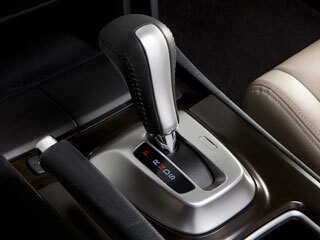 The automatic transmission helps ensure that you’ll be able to hand the keys off to the kids when need be without worrying how well they drive stick, too. Upper and lower control links are used in the Crosstour’s front suspension to tune it for emergency maneuvering, responsive cornering, and a stable riding experience. The front shocks have a rebound spring and work with the suspension to improve the road contact of the front tire during cornering. Grade Logic Control is able to detect a given driving situation and set shift points based on that rather than the limited abilities of other computer controlled shifting programs. It helps avoid hunting for gears when climbing and can even downshift for engine braking when needed on descents. Available on Crosstour V6 models, the Real Time 4WD system detects whenever the Crosstour has lost traction and directs engine power to the rear wheels to help offset the slippage. This hydraulically actuated system responds immediately, operating only when needed to help get you through tough terrain before switching back to front-wheel drive. One of the safest family vehicles on the road today, the 2015 Crosstour earned rankings of “good” from the IIHS on moderate overlap frontal offset collision, side-impact, and roof strength tests. 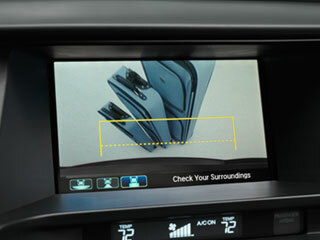 Not only is this Honda built for safety, it has some of the most advanced safety technology available as well. Every Crosstour comes with a standard rearview camera with guidelines that make things like parallel parking and backing up easier. If you upgrade your Crosstour to the EX-L trim or add on the V6 engine, you’ll get a multi-angle rearview camera to give you multiple views of what’s behind you before backing up. 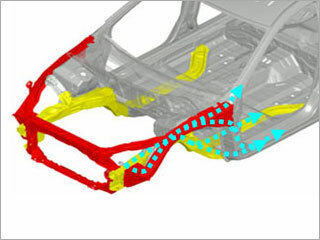 This Honda-exclusive frame design is the state-of-the-art in automotive safety; it works to redistribute energy during an accident and send it evenly across other vehicles to help reduce the risk of injury to you and your passengers. From the frame to the finish, the Crosstour is built with safety in mind, and it all starts with the ACE Body Structure. 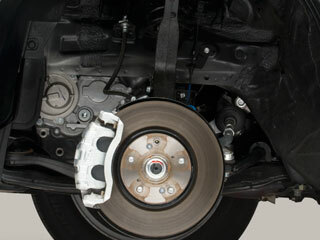 4-wheel disc brakes come standard on the Crosstour to help give you added stopping power, and the anti-lock braking system keeps your wheels from locking up. 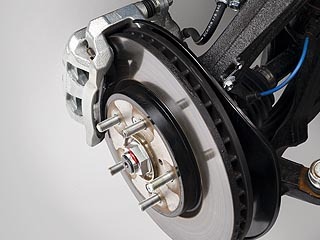 When combined with Brake Assist and Electronic Brake Distribution, these systems help give you the most control over stopping your vehicle quickly and reliably in even the worst driving conditions. 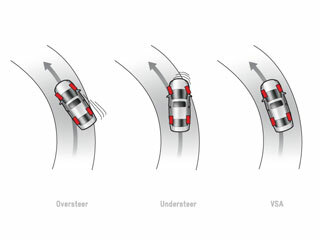 In the event of an oversteer or understeer scenario, Vehicle Stability Assist can brake individual wheels or even reduce your engine’s overall output to help keep the Crosstour in a straight line and prevent spinning out or fishtailing. 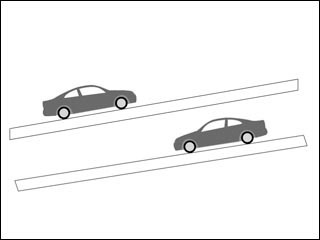 Vehicle Stability Assist works together with Traction Control to help keep you from losing control of your vehicle. Side curtain airbags give added protection to outboard passengers and the driver in a side impact collision, but the Crosstour also features a sensor that triggers the side curtain airbags in a rollover to help keep everyone safe if the vehicle rolls. 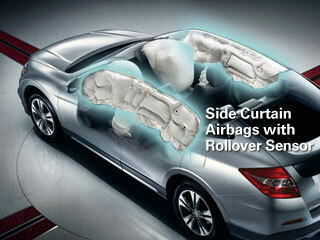 Few family vehicles provide rollover protection via side curtain airbags. 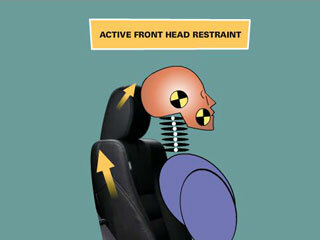 Designed to move up and forward in a fraction of a second, active head restraints can help reduce the likelihood of neck injuries in a rear-end collision by providing firm support for the head and neck of passengers. Honda knows that many drivers who choose the 2015 Crosstour will be spending quite a bit of time behind the whee, and they have designed the cabin for optimum comfort and versatility to make it even more appealing. With seating for up to five that can easily shift around to accommodate the expandable cargo area and state-of-the-art features like the HondaLink interface and satellite-linked navigation, the Crosstour has one of the most advanced interiors of its kind. 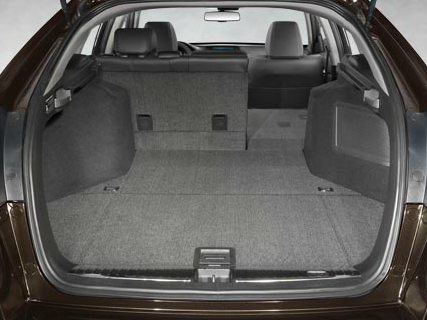 The 25.7 cubic feet of cargo space available on the Crosstour is sure to be enough for everyday use, but if you need to expand it, Honda has a 60/40 split rear seatback that easily folds out of the way and lets you expand the cargo storage to as much as 51.3 cubic feet of space. 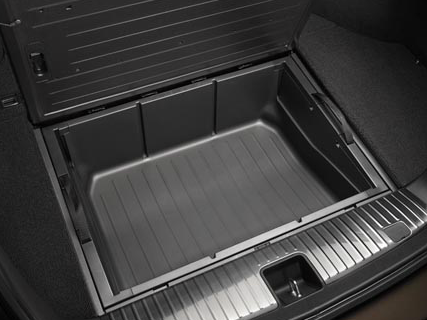 In addition to the standard cargo area, Honda includes a water-resistant utility box beneath the floor of the Crosstour’s cargo area. It’s perfect for emergency kits, tools, or seasonal necessities like tire chains or gloves. And when you need to take it out, you can lift the utility box up and out with its attached handles for easy cleaning. 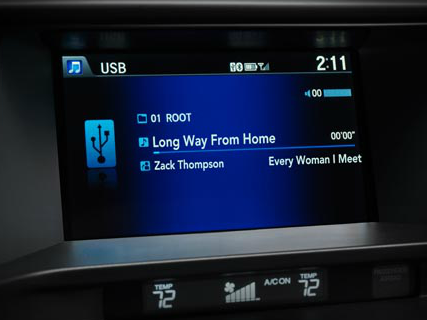 The intelligent Multi-Information Display is Honda’s exclusive touchscreen interface that gives you direct access to HondaLink, lets you manage your Bluetooth settings and control music streaming, choose stations for Pandora internet radio, and more. It can even be customized with a personal wallpaper to give the Crosstour a more personal touch. 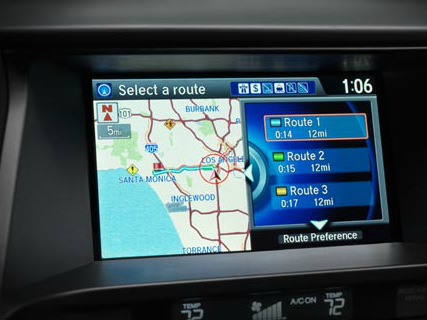 Honda’s available navigation system features voice recognition technology and can recognize street names, cities, and over 1,500 other voice commands that make managing your entertainment while driving a piece of cake. 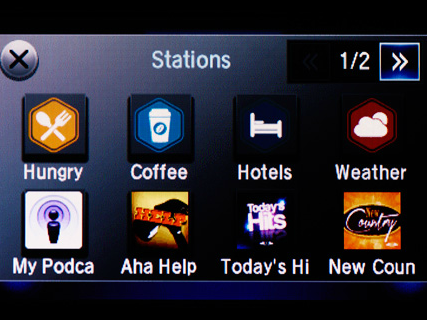 The database Honda’s navigation system references stores up to 7 million different points of interest along with their Zagat reviews and ratings. If you’re tired of fumbling for your keys when you’re in a hurry, Honda’s available push button start system takes care of that for you. The Crosstour can detect when you have your key fob within the vehicle, and then you’re just the push of a button away from being on your way. No need to turn over a key ever again. We think that the 2015 Crosstour comes with some of the best features available on a modern car, but sometimes you need a little something extra. Honda has you covered with one of the widest selections of accessories, including multiple cargo hauling add-ons, stylish interior accents like soft blue LED lighting, and a set of lightweight 18-inch alloy wheels. Building the Crosstour that fits your needs is as easy as finding the right accessories. 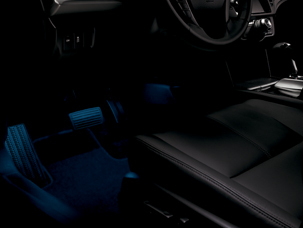 Soft blue LED lighting in the front footwells offers the Crosstour an aesthetically pleasing, upscale feel at a low cost. LED lights are cool to the touch and use minimal electricity. Set to integrate with the interior lighting of the cabin, the soft light glow can also be turned on and off at will as well. 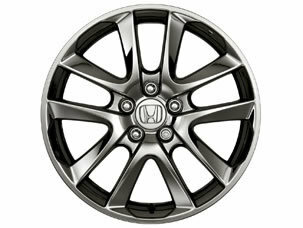 These chrome-look alloy wheels are crafted from aluminum and bring an extra “wow” factor to the Crosstour. In addition to looking incredible, alloy wheels are able to improve the longevity of suspension joints and wheel bearings, and they last longer and are more durable than steel wheels. 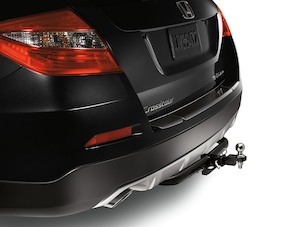 While the rearview camera may be close enough to having eyes in the back of your head for some drivers, we recommend Honda’s back-up sensors for that extra peace of mind. 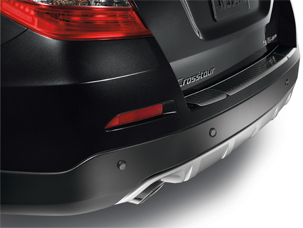 Color-matched to your Crosstour’s bumper, these four sensors will emit beeps that become more frequent as you get closer to an object. The cargo space of the Crosstour may make it tempting to toss your skis in the back for the next trip, but on the way home they are certain to be dirty, wet, and maybe even muddy. 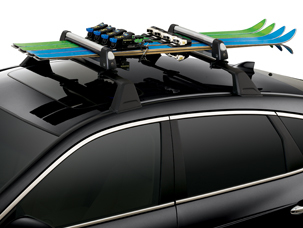 You don’t want that in your cabin, and the available ski attachment lets you lock your skis in place atop your Crosstour. It can even hold two snow boards if you want to change things up. When properly equipped, the Crosstour can tow as much as 1,500 pounds, but in order to do so, you’ll need Honda’s Class I Trailer Hitch, which is mounted directly onto the frame for maximum durability. The receiver-style design of the hitch makes it compatible with most common trailer setups. We’ve all heard things sliding around the back of the car when you have to take a sharp turn or slam on the brakes, but wouldn’t it be nice if all of that stayed in one place? 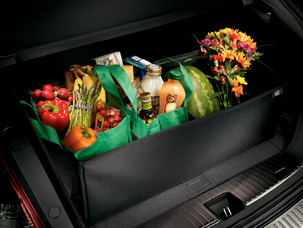 Honda’s cargo organizer makes that easy. Built for the Crosstour, this sturdy canvas box offers rigid support and can collapse away when needed. The organizer’s dividers keep everything separate and organized, too.